When you want a thrilling show that will keep you on the edge of your seat, make sure to check out the Haygoods! 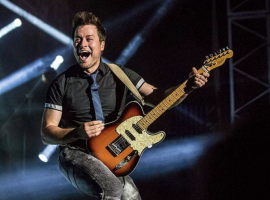 The Haygoods are celebrating over 26 years of performing together. The show features songs that everyone will be able to sing along with. You’ll want to keep your eyes peeled for a couple of the brothers zooming through the air playing their instruments! Audience members will love the variety of songs and instruments played. Besides incredible music, the show is known for its’ spectacular lighting! The Haygoods are constantly coming up with new ideas for their show. This year a stunning light display is featured on each of their white instruments as they play. Their outfits light up and it makes each song just a bit more special. This award-winning, family musical entertainment group, consisting of five brothers and one sister (Timothy, Patrick, Dominic, Michael, Matthew and Catherine) has performed over 7,000 shows for 6,000,000 people during their incredible Branson career! Each of the six siblings is incredibly talented and showcases their skills each night. The show includes amazing vocals, innovative choreography, and awesome performances on over 20 different instruments. You can find the Haygoods at the Clay Cooper Theatre. For tickets, click HERE.